Most of us rely on Google more than we’d care to admit and are occasionally caught off guard when a hastily spelled word or seemingly simple search term yields a racy result, making us paranoid for when our kids type away while doing homework or during screen time. The newly launched Kiddle, which is powered by editors and Google safe search, will make sure those “oops” moments don’t happen, whether you’re watching over your child’s shoulder or not: it’s a kid-friendly search engine that carefully curates your child’s online searches and guarantees they’ll be scandal-free. When your child starts a search, whether it’s for photos, videos, or websites, the first few results are handpicked by editors and display sites that were geared specifically for children. The next several focus on sites that use simple language that’s appropriate for young children. After that, the resources include sites written for adults, but which are still filtered by Google safe search. The site itself looks similar to Google, with an emphasis on bright primary colors, and features a space themed background with a robotic creature as the search engine’s “guide.” For those kids who like to outsmart the system, we’ve got some unfortunate news (i.e. good news for parents). Searching for “bad” or inappropriate words results in zero results shown, with the robot telling kids to try their search again. Parents can take increased precautions by blocking additional words or phrases or even sites that they don’t approve of. Kiddle acts as an extra parenting eye for when kids are online innocently searching for their favorite movie star or musician. 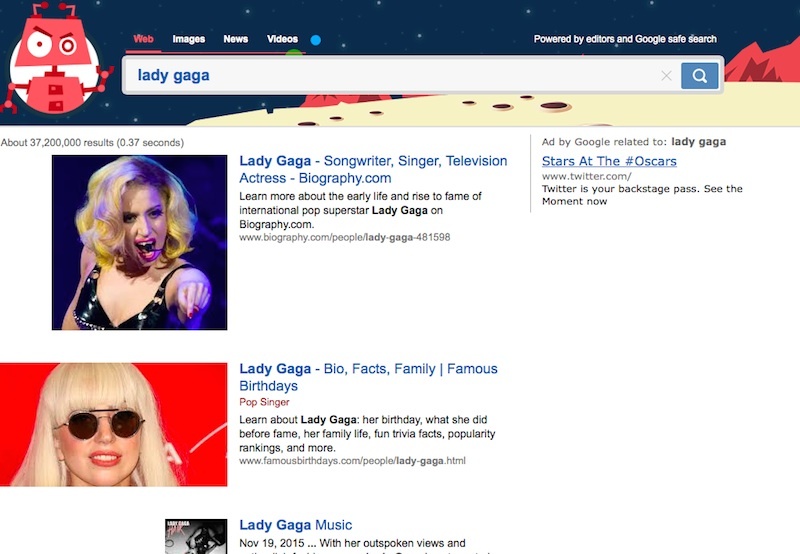 The search engine will only show child-friendly facts, bios, and news items, so you don’t have to worry about your child learning about the celebrity’s Saturday night antics. The search logs are cleared every 24 hours on Kiddle and no personal information is stored. So whether our little ones are looking for Lady Gaga or Lady and the Tramp, Kiddle guarantees a safe, kid-friendly viewing and learning experience. One less scary thing on the internet to be concerned about=parenting win. Most of us rely on Google�more than we'd care to admit�and are occasionally caught off guard when a hastily spelled word or seemingly simple search term yields a racy result, making us paranoid for when our kids type away while doing homework or during screen time. 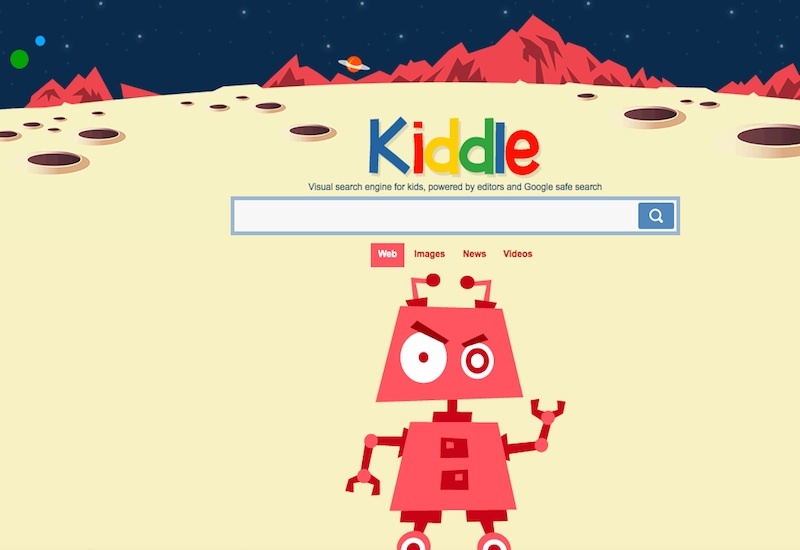 The newly launched Kiddle, which is powered by editors and Google safe search, will make sure those "oops" moments don't happen, whether you're watching over your child's shoulder or not: it's a kid-friendly search engine that carefully curates your child's online searches and guarantees they'll be scandal-free.�When your child starts a search, whether it's for photos, videos, or websites, the first few�results are handpicked by editors and display sites that were geared specifically for children. The next several focus on sites that use simple language that's appropriate for young children. After that, the resources include sites written for adults, but which are still filtered by Google safe search.